Ann's Midnight Poppies collection may be hitting stores, but her previous line, Cat-I-Tude, is still going strong! Today we're featuring a quilt from Quilter's World that uses the Cat-I-Tude fabrics. What attracted you to the Cat-I-Tude collection? 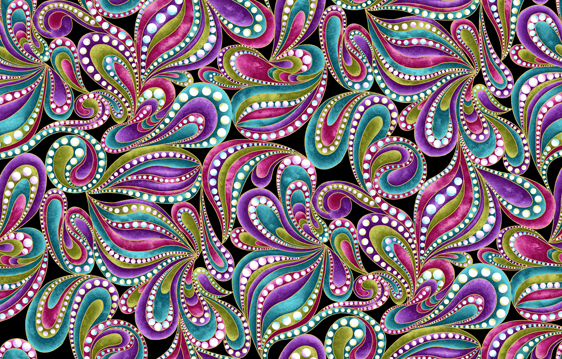 I really love the paisley swirls! There's so much detail and depth in that fabric, and it ties the entire line together. 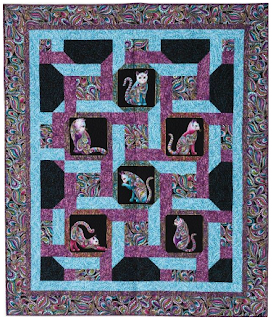 It's also a fun challenge to design a quilt featuring fussy-cut blocks; I wanted a quilt that would highlight the cat blocks but also have interest in the background. How did you choose the coordinates to use? Aqua is my go-to color, so that was easy. I tried a digital version using green instead of the purple, but it didn't pop the way I wanted it to. I chose to use the cat blocks on black and the black tonal background to enhance the rich contrast of the colors. Tell us about your design. I've designed several quilts with a woven look. I like the over-under illusion, and the depth that it creates. I actually designed this quilt about a year before Ann's fabric came out but hadn't found the right collection for it yet. It seemed to work perfectly with these prints. Tell us about the machine quilting. Diane Oakes has quilted several of my woven quilt designs, and I think she does a great job. She chooses one motif (and thread color) for each "weave," so for example the purple areas all have the same design. This helps to enhance the woven idea. 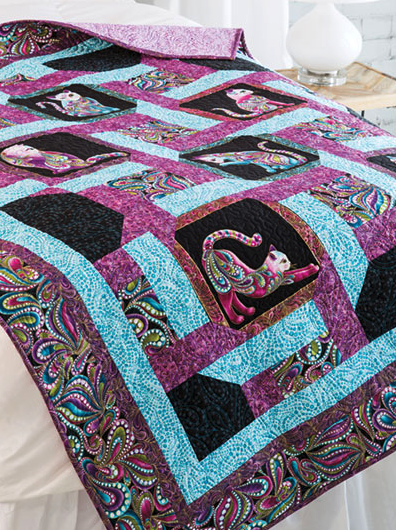 She followed the paisley lines in the outer border and also quilted some of the details on the cat blocks. Definitely the woven effect. I like that it creates the illusion of dimension. Click here to see the entire Cat-I-Tude collection by Ann Lauer. Click here to order the kit for Cats on Parade. 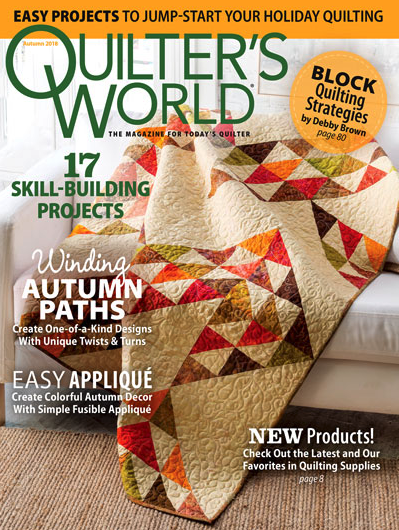 Click here to purchase the fall 2018 issue of Quilter's World. 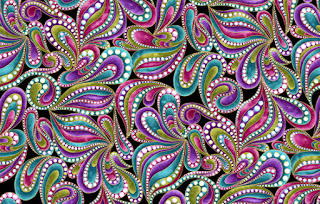 That fabric is gorgeous! 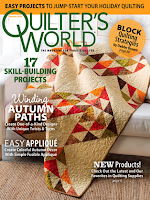 Check out LilyPad Quilting for a yearly contest of Pets on Quilts! Soft Tech Geeks is a chinese underground organisation of computer experts and hackers. We stay discrete in order to prevent the identity of our clients from FEDs and individuals. • Hacking really takes the right tools and equipment (Spywares and other necessary softwares). Most people really think that a hacker can just breaking into a security system just by browsing through the site. But if you really need a hacker we are here for you. We give you full details of our strategy on how we are going to get the job done, then you can decide if we are really or not. • We don't ask personal questions about you and we dont give out our personal information. We strictly do business and don't expose you or your service to you to anyone. That's how discrete we are. As long as technology is involved anything can be hacked. *Most people want to Hack a target's email I.D, social media websites or apps, smartphones, for many reasons such as husband cheating on wife, girlfriend cheating on boyfriend. *if you need to hack a particular organisation so as to sniff, delete, change a particular information or records. *as a parent you might need to monitor what your children are doing on social media and on their personal computers or even clone their phones to also hear their calls or see text messages on any app they chatting with, so that they don’t get into trouble. *if you want to hack a private domain email account(business email). *some people want to mine bit coin, we can create a platform for you to mine bit coin without having to cheat anyone. All these are what we can get done within few hours. Fankly speaking, we always give a 100% guarantee on an job we take. Time to complete a job depends on the complication of the job and if we take your job then be rest assured that it will be done, and we give you a 100% assurance that we cover our tracks well enough, so when we do a job its like we were never there. We have also come across FAKE HACKERS claiming they will get the job done in a short time , and sharing testimony of themselves but they are all scams (AVOID THEM). REMEMBER THIS "AS LONG AS IT'S TECHNOLOGY IT CAN BE HACKED"